DNAdmin offers virtual call center and answering services: Virtual Call Center services include a live administrative assistant who answers your office line, takes messages and promptly delivers them to you via email, phone call or text message. We schedule your appointments, book your meetings, and upsell your services! It's easly done! Your phone number is simply and inexpensively forwarded to DNAdmin so that when we answer it! Your clients think they are calling your office, not your answering service. Have a professional administrator answering your incoming calls during your business hours. She is the gatekeeper and will keep out unwanted solicitors and telemarketers. One low monthly flat rate and you have a professional, sharp, polite and knowledgeable person answer your phones. No more losing clients or sales because prospective clients. DNAdmin has a 100% proven track record for increased revenue for small business call center clients. Answer incoming line with your business name. Always upbeat, always personable, always professional. Take messages with name, phone number, and brief message. Provide basic product/service information that suits your company. Step by step details from your setup protocol that is agreed upon. 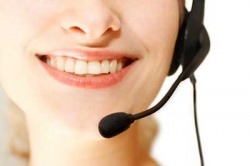 **Tell us what your administrative needs are for your business answering call center. If the above description of services need to be altered to be a good fit for your company, we will oblige! Fees changes may apply.